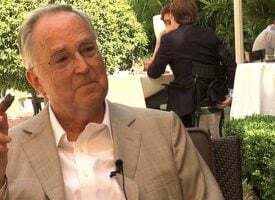 With continued uncertainty around the globe, today the man who has become legendary for his predictions on QE, historic moves in currencies, told King World News that a Swiss bank has said it will no longer hand over clients’ physical gold. Greyerz also issued serious warnings about many other Swiss banks. What The Hell Is Going On With Swiss Banks? A client stores physical gold in a bank but when he wants us to organize a transfer to private vaults, the gold doesn’t exist and the bank must acquire it. 400 oz gold bars that were bought by the bank for the client in 2005, were cast in 2011, so the gold never existed. The client is told he owns physical gold and silver but actually only has paper metals. Swiss banks are also doing all they can to stop clients taking their gold out. One major bank refuses to transfer gold out if the client isn’t present. Another major bank recently told the client that they don’t transfer client gold out of the bank to anyone, even if the client demands it. Swiss banks tell their clients that physical gold and silver held in the bank vaults on behalf of clients is not on the bank’s balance sheet and based on Swiss law it belongs to the client. Yes, that is correct, but how many times have we not seen that banks under pressure use client assets as security for their trading, especially when they are under pressure. Egon von Greyerz continues: “It is, obviously, no use to own a share in one or many 400 oz gold bars. Gold investors must have their own bars and preferably of smaller denominations like 100 grams or 1 oz. If gold is ever needed as money or barter, 400 ounce or even 1 kilo bars are just too big. Switzerland probably has the best political system in the world and the economy is very well run. Just a pity that the Swiss National Bank and banking system have totally abandoned the old style Swiss Banking which was based on conservatism, service and personal liability. Previously, the partners in the Swiss private banks were personally liable for the bank’s balance sheet. If all banks in the world were run on that model, there would seldom be a financial crisis. Banks would be run with prudence and conservatism. But instead we have a system with bank management leveraging the capital hundreds of times if derivatives are included. Profits are then privatized and losses are socialized, i.e. picked up by government or depositors. The old Swiss banking model was superb but was totally destroyed by the US government going after many Swiss bankers and asset managers. Interestingly, no one has gone after the management of all the major US banks, which cost the world tens of billions of dollars in 2007-2009. 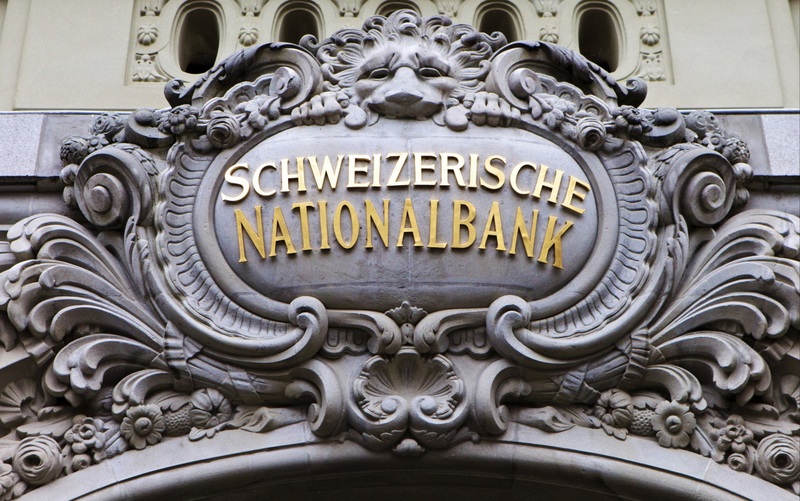 As I discussed in a recent KWN article, the Swiss National Bank is the world’s biggest hedge fund and the Swiss Banks are too big for the country. This is, sadly, the result of the US model, as well as greed, having taken over the Western financial system. The Swiss banking system is 5-6x Swiss GDP which is too big for the country. This was the size of the Cypriot banking system when it collapsed in 2013. Sadly, Swiss banks are as risky as all major international banks and not the place to hold major assets, in our view. On the other hand, if you look at the Swiss economy and political system, it is probably the best managed country in the world. Just recently I had real evidence of events that happen in no other country. The Swiss VAT (value added tax) rate will be reduced from 8% to 7.7% as from January 1st, 2018. We also received a letter from our office landlord in Zurich that the rent would be reduced. In what other country in the world are taxes and rent reduced? None, of course, since everything goes up in line with debt creation and money printing. But not in Switzerland because it is a well-managed country, ruled by the people and not by an irresponsible government. The VAT reduction was the result of a recent referendum week, rejecting a VAT increase to finance state pensions. The government backed proposal was kicked out by the Swiss people and as a result, rather than increasing VAT to 8.3%, it was reduced to 7.7%. In the rest of Europe, a VAT reduction is unheard of. VAT started as a low sales tax in many European countries and gradually increased to levels of 20-27%. But not only has no other country lowered VAT but every time any tax is increased, the people have no say. Taxation is decided by parliament in most countries. The system of direct democracy in Switzerland makes it the best managed country in the world. Government has less power than in any other Western country. The position of president changes every year among the 7-member coalition cabinet. The Role of the president is ceremonial. The Swiss Parliament meets 4 times per year for three weeks. The daily sessions during that time are relatively short. That is a total of 12 weeks that the elected members need to “run” the country. This is refreshingly short compared to most other nations in the world. Much of the political and fiscal direction of the country is determined by the Cantons (local States) which also receive most of the tax revenues. For many people who own gold, the wait seems very long for the gold price to reflect the massive money printing we have seen since 2007. Yes, it is true that gold in US dollars has looked lackluster since 2012-2013. But we must put that into perspective. Since 2014, the dollar has strengthened within its long-term downtrend. 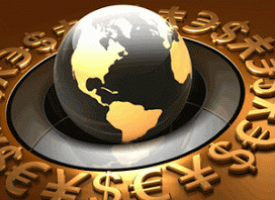 The dollar’s temporary rise most probably finished at the beginning of 2017 and at some point, in the next few years, it is likely to hit a black hole and disappear into oblivion as China, Russia and other countries kill the Petrodollar. But even with a temporarily strong dollar, gold has performed very well, even when measured in dollars. After having gone up 7x (monthly close) between 1999 and 2011, there was a 4-year correction to 2015. In time, this correction was 36% of the 1999-2011 period which is very near the normal Fibonacci 38% period that would be expected. So although it has seemed long, it is timeless what would be expected. 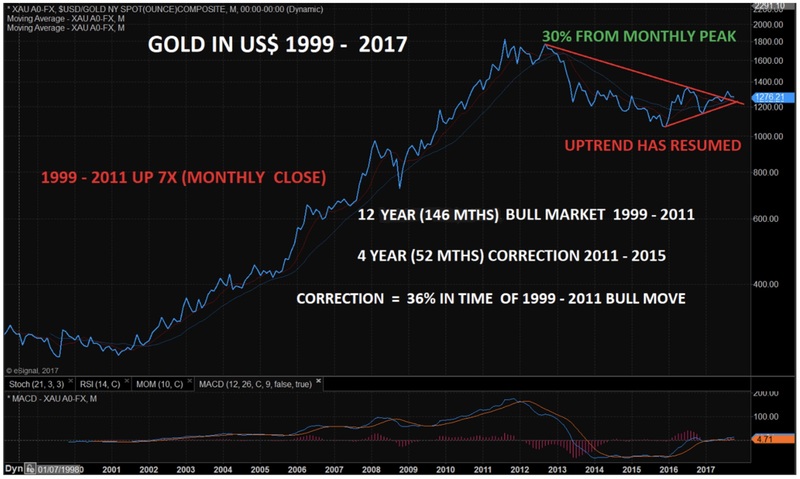 Gold priced in dollars is still 30% off the monthly all-time high close but that gap is likely to be closed fairly quickly. If we look at gold in other currencies, the correction was both shorter and smaller. In Canadian dollars,for example, the correction took only 2 years to 2013. The gold price in Canadian dollars is today only 11% off the monthly closing all-time high. 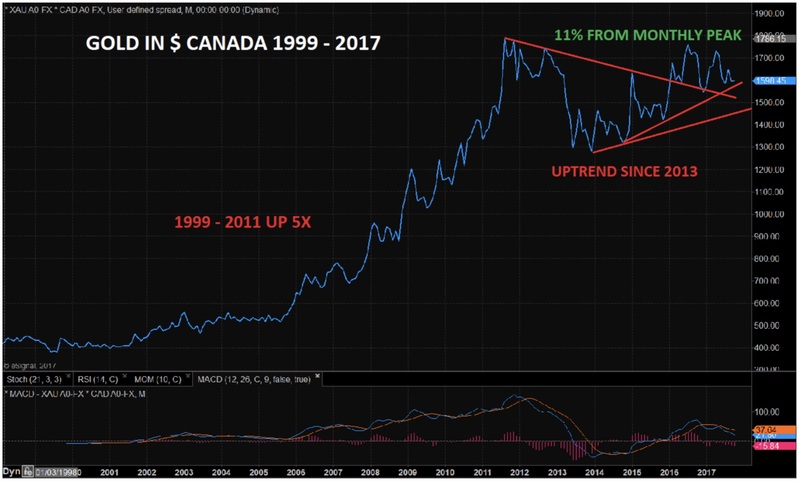 Gold Priced In Canadian Dollar 11% From All-Time High! The picture is the same for gold in UK Pounds. 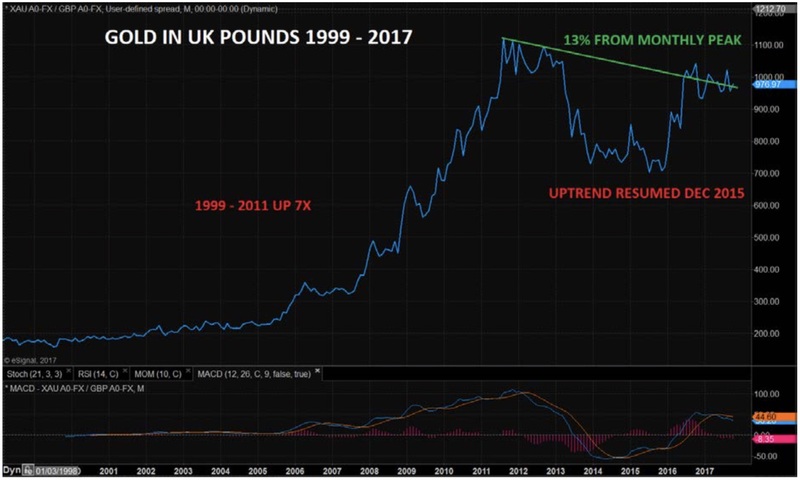 The price is only 13% from monthly peak in 2011 and gold in pounds is now on the way to new highs. Gold Priced In Pounds Only 13% From All-Time High! Thus, in most currencies, except in the US (priced in dollars), gold has performed very strongly both in time and in price. The uptrend is clear and it is not a question of if, but when, gold will break out to new highs. Whether that happens in 2017 or 2018 is really irrelevant. What is certain is that this next move up is virtually guaranteed to happen. Finally, let’s look at Gold vs the NASDAQ. Between 2000 and 2009, the NASDAQ fell 93% vs gold. 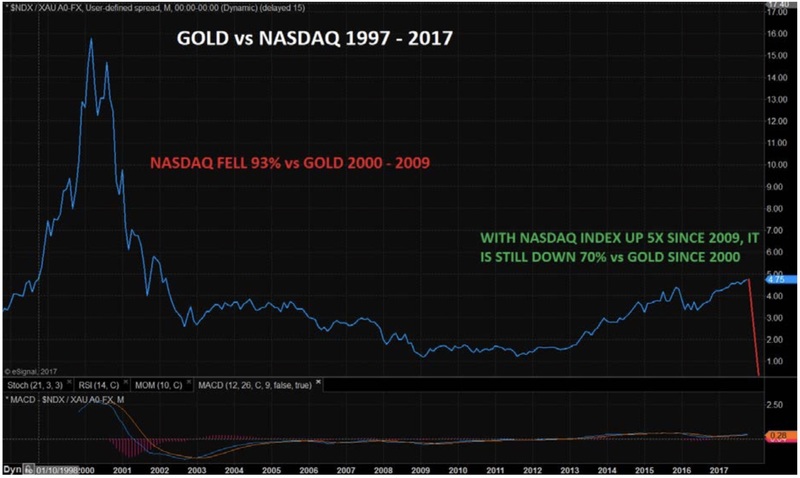 In spite of a 5-fold increase in the Nasdaq index since 2009, the correction against gold is minimal since the NASDAQ vs gold is still down 70% from the 2000 peak. 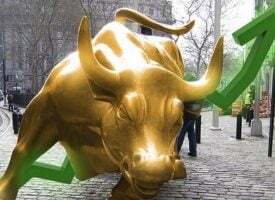 Whether this cross turns down this year or next, once it turns we will see a fall of at least another 93% and probably more, just like in 2000-2003. Clearly, no stock market investor believes that such a dramatic fall is possible. But back in January 2000, nobody believed that the Nasdaq index would fall 80% within 2 years either, or that it would fall 93% vs gold. ***ALSO JUST RELEASED: Greyerz – China & Russia Positioning To Collapse Us Dollar As Global Financial War Heats Up CLICK HERE.